For the our final entry into Redux Month, we're redoing images that the other person did but didn't especially like. We wrote some lists for each other and picked one creture. 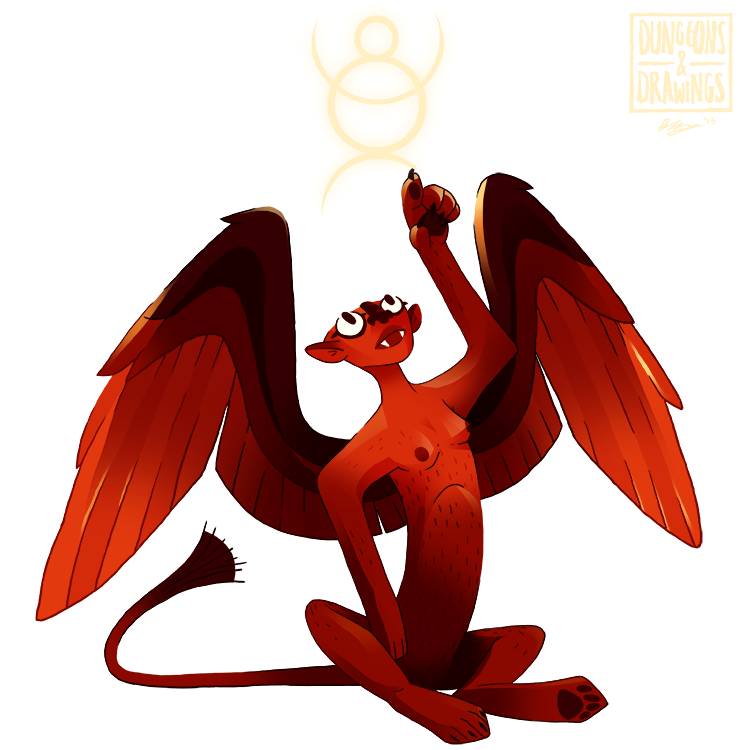 I chose to redo the gynosphinx, an image Joe did about two years ago. The Sphinx we're most common with is a unique Greek creature, famous for her "four legs, two legs, three legs" riddle. Fun fact: some sources say that the Sphinx was actually the child of the Chimera and sister to the Nemean Lion (slain by Hercules as his first task). Historically, the Sphinx is actually a Greek creation, has no wings and has the head of a man. D&D has that one too, and calls it the androsphinx. 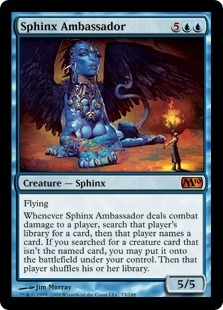 I was originally gonna do this Sphinx in blue as a reference to one of the prettiest sphinxes I've seen, the Sphinx Ambassador for the Magic card. But I couldn't make the blue work and a lot of stuff I've done is blue and I guess it probably would've been more a rip off than a reference. So red it is. The flying merchants of Gth'yr are a common sight in most of the cities of the world. 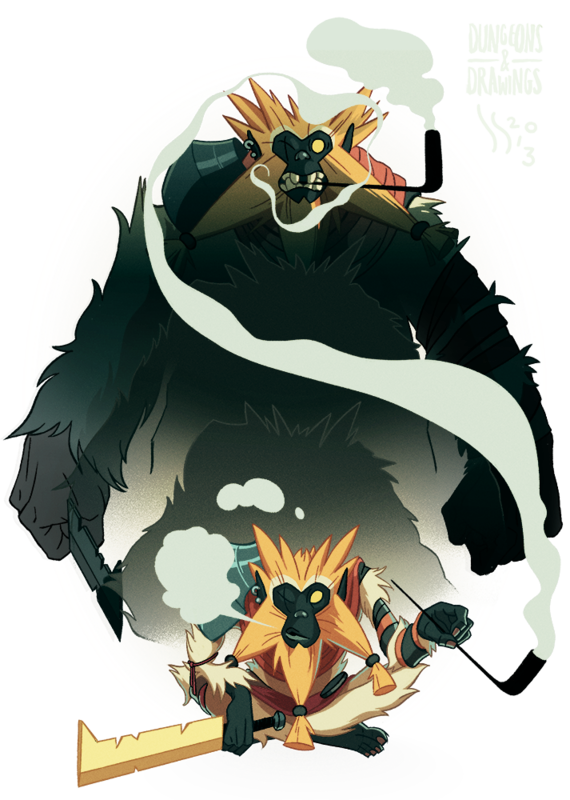 An ancient guild of peddlers, they grew from small beginnings in the aviary-towns of the southern mountains, trading wares from settlement to settlement, and have since steadily increased their reach over several hundred years to cover most of the world. As their name implies, the merchants ferry their goods by air, having for many years employed the services of the great Yrthaks - enormous, sightless, crocodilian flying creatures- to aid them. 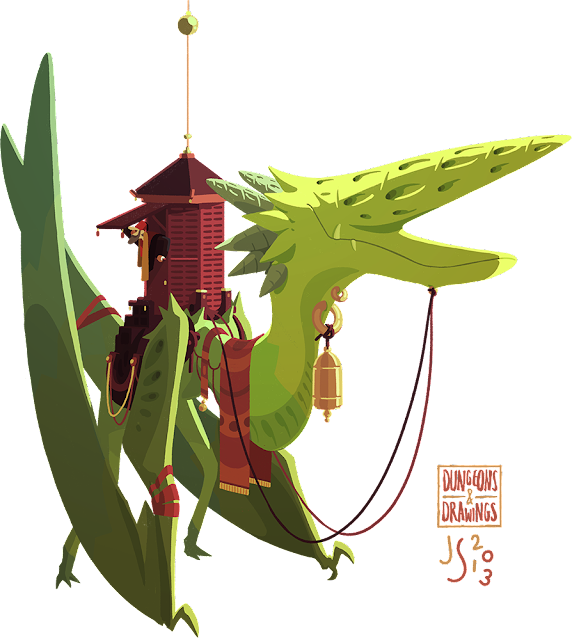 The merchants have tamed the beasts through use of certain combinations of wind chimes and bells (to which the Yrthaks are, of course, highly sensitive), which also serve as a distinctive herald for the traders' arrival! Wow! This one took a while, but I'm quite happy with it. I'm almost afraid to post the old Yrthak drawing I hate it so much, but for the sake of posterity (and reassuring myself I've gotten better) here it is. Don't laugh. The creature is modeled a bit off those weird Pteranodons that sort of look like giraffes. It's sort of inspired by the Dinotopia series of books, which I liked a lot as a kid and rediscovered recently. Redux number three is the Will O Wisp. I think that out of all of the images I've done for this blog, that particular one is my most hated. Partially because it's so ugly but also because it feels like the intention I had behind it was pretty strong and was unable to carry it out. I'd been inspired by a book called Art Forms from the Ocean, a collection of prints by Ernst Haeckl of microscopic sea animals and plants. They're all pictures of quite beautifully geometric living things. Which I guess means I copped out a bit by doing a good deal more typical Will O Wisp: a floating flame. But I'm still more pleased with this one than the older version. At least this is well drawn and kinda cute. Fun fact: an alternate name for the Will O Wisp is the Hinkypunk. I remember reading that in one of the Harry Potter books (Prisoner of Azkaban, I think), describing the Hinkypunk as a one-legged creature that carries a lantern to lead people into bogs. I always thought that it was a creature that Rowling had made up, but it would seem it's a legit alternate version of the Will O Wisp. Fun fact number two: a Hinkypunk (i.e. the one-legged dude) appears towards the end of Spirited Away, leading Chihiro to the Zeniba's house. Here's my second image of Redux Month, the Spriggan! You can see the old version here (if you wanna). I faffed for ages with this one and I'm sort of lukewarm on it, but I still like it better than the original. I actually hate looking at the old one because at the time I was experimenting a lot with this attempt at scratchy black linework that looks kinda brushy in imitation of artists like Nate Powell and Paul Pope, but I could never get it looking right because my basic drawing skills aren't up to it. I guess I quite like the sheer amount of hair he develops after "hulking out" (Spriggans, in case you didn't know, can grow in size from a small gnome-like creature to a gigantic gorilla monster) - here the change in appearance is less extreme - he just sort of thickens and his hair becomes a little tuftier. Looking between them I think my approach to linework is better in general now, I feel like I don't have to "fake" a lot of the things I used to. The dude here is modeled on a gibbon, which are my favourite apes. Sorry about the slow posting this month, I'm working full-time on a commercial job and I'm trying really hard to keep the quality up so I don't feel like I've regressed! !